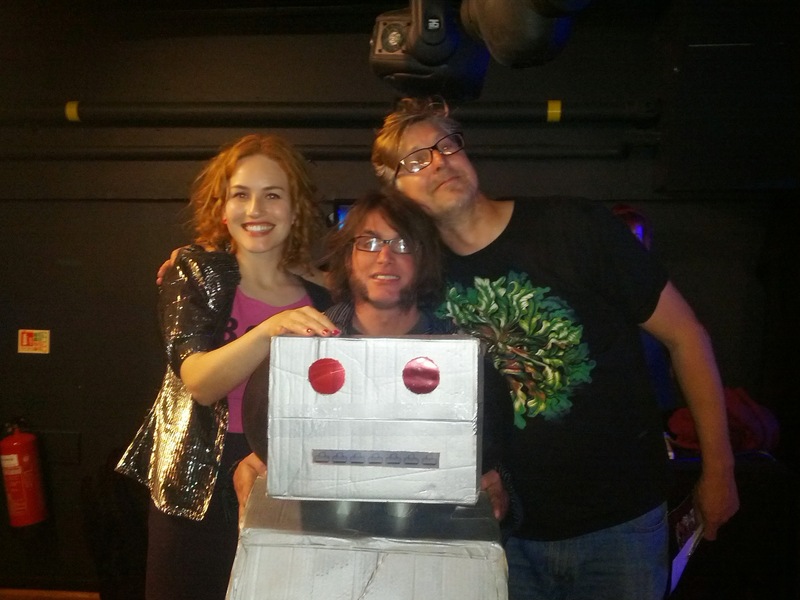 The MechaPoet has now retired from performance. She currently sits on a chair in my flat beside the printer. I like to think they are friends; possibly, in time, something more. 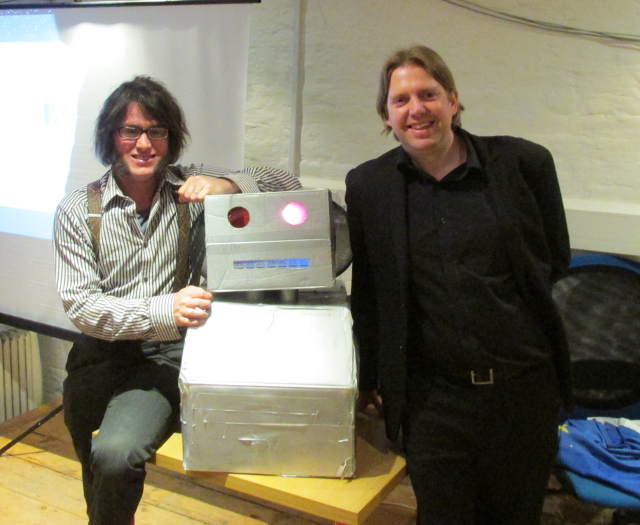 MechaPoet was an attempt to produce a performance poetry robot. The idea came from discussions about creating real-person slash fiction with text generators. This led to the idea of MechaPoet, an attempt to relieve human beings from the drudgery of writing poetry. Me and Chris (my partner in the enterprise) have posted a few times about this (1, 2, 3 posts from me and one from Chris ), but I thought I’d do a quick overall post summarising things. The technical side of MechaPoet was relatively unsophisticated, being based upon Markov Chains. The wikipedia page on this is not a particularly easy read. A simple way to explain them is that the Markov chains store every combination of two words in a text, and the word that follows them. This map of the text can then be used to generate plausible sequences of words that aren’t found in the original text. The best explanation of Markov Chains is by on-the-lambda.com, who illustrate the concept with the Smiths song, this Charming Man. They go on to show how Markov chains can be used to generate wine reviews. As someone who gets a bit sketchy and stressed out when I hear a lazy rhyme (part of the reason that I gave up rhyming altogether a couple of years ago), it might sound like quite a contrary request, but I think it gives a real shape to what MechaPoet comes out with, and makes the leap from the sort of Avant-Garde poetry that looks like an arbitrary list to the sort of semi-avant-garde-rhyming-doggerel that can be all too familiar to someone who goes to enough poetry nights. What was surprising was what eventually came out – sometimes, poems that are genuinely quite moving, and which contain some remarkable and surprising images. The idea such an unimpressive way of generating the content was not simply laziness. I’d been thinking of something Matt Jones had said, about being ‘as smart as a puppy’: “Making smart things that don’t try to be too smart and fail and, indeed, by design, make endearing failures in their attempts to learn and improve. 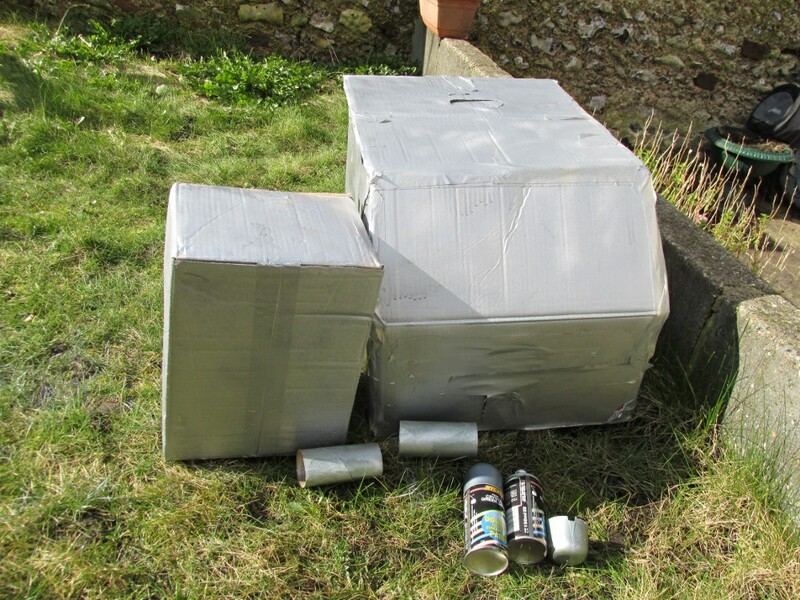 Like puppies.” The idea bring that it’s best not to try being too clever, but to cover for the shortcomings by being charming – hence the cardboard body of the robot. A good example of simplicity working well is a bot written by Mark Humphrys which ‘passed’ the Turing test with “profanity, relentless aggression, prurient queries about the user, and implying that they were a liar when they responsed”. There’s also the classic story about the Eliza bot, where people felt their interactions with it were both significant and personal. We had an interesting ‘uncanny valley‘ problem with the voice. The first version of the MechaPoet used the FreeTTS voices, which were good enough to tell that you were hearing poetry, but many of the words were garbled. 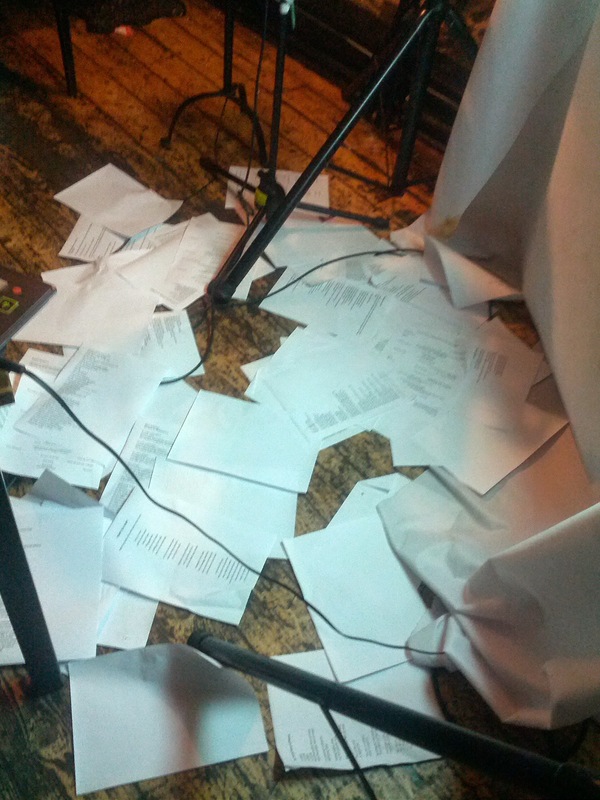 After a show-and-tell at Brighton Java, Luke Whiting suggested using Google text-to-speech. This is incredibly good, so much so that I had to make it sound imperfect to make the listener more sympathetic. (There was some research on this effect, and I’ll add a link when I find it again). 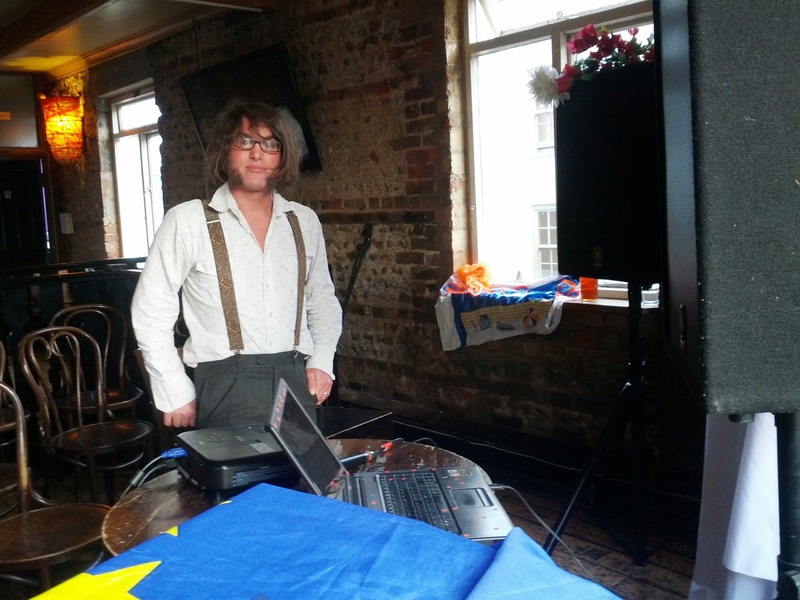 The final version of the MechaPoet was a server-based poetry generator which was accessed by an Android phone providing the speech generation. During the project I met up with zenbullets and shardcore, two local digital artists. I first met them after telling them their dedbullets collaboration was featured in Kenneth Goldsmith’s Uncreative Writing. Zenbullets’ book Novelty Waves is worth a read, by the way, and some of shardcore’s talks are online – for example, What is it Like to Be a Bot? There are still some fun projects involving the technique. King James Programming takes three texts as its source, moulding them into a new form. (“And it came to pass, that he who fleeth from the noise and confusion of ordinary software engineering or academic research.”) Or there is Garkov, which uses Markvo chains in an attempt to produce plausible Garfield strips. I also wrote The MechaPoet in Java, which is a lousy language for hacking together prototypes, particularly for text manipulation – but when I wanted to produce the robot, I didn’t want to fiddle about learning Groovy, or sharpening my blunted Python skills. MechaPoet was intended as a performance poet. She was involved in Chris’s award-winning Brighton Fringe show, as well as an appearance at the Hammer and Tongue night which, I think, baffled people more than it entertained. 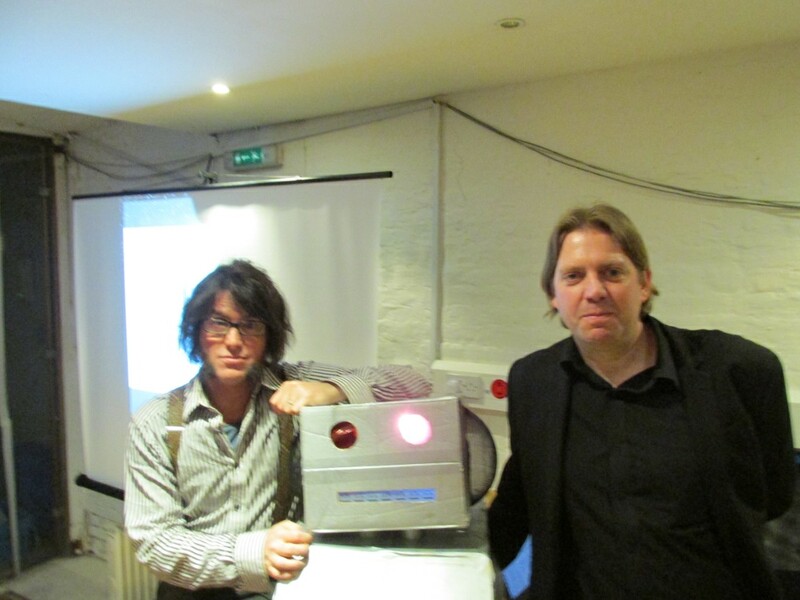 We never quite managed the trick of making MechaPoet entertaining rather than interesting. 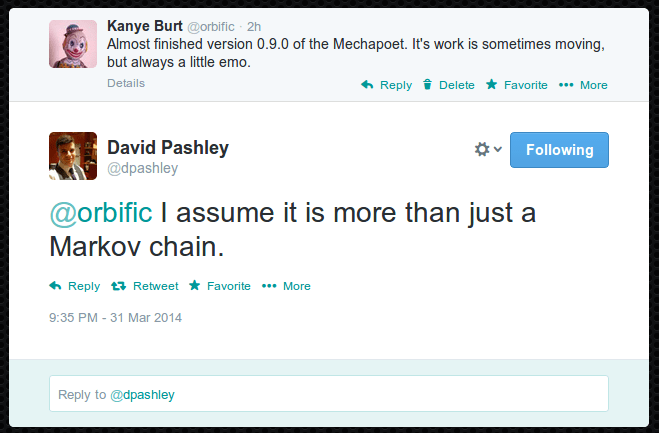 I do want to return to the MechaPoet project at some point. I started work on a haiku generator (referring to haiku as the 5-7-5 version of the form). I’m convinced that the constrained, gnomic style of these haiku means it would be easy for a computer to create poetry far superior to what humans could do. My eventual plan is to use some sort of Bayesian filtering to pick good haiku. So far, I’ve got no further than a rather scrappy github repo. But it does at least have some unit tests. I must also recommend Bot or not, which allows users to guess whether a piece of poetry is wtritten by a human or a computer. Apparently Blake’s The Fly is the most human-like poem written by a human being. Where to publish your stories? 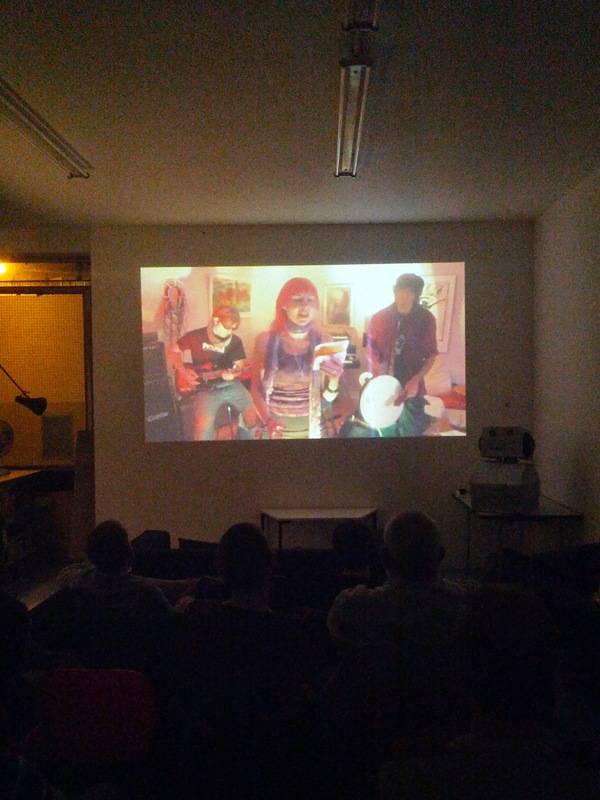 On Thursday 25th I was involved in Flash-Fiction cinema with my friends Amy and Chris. The main feature of the night was a series of filmed short stories that had been sent in; and Chris and I each gave a talk about new types of fiction. I spoke about Creepypasta, Slenderman, and the way truth and fiction merge. Writing the talk was interesting, provoking nightmares and night-terrors for several nights. Chris’s talk was about online hoaxes as storytelling, something he has quite a reputation for. We learned about the Bicholim Conflict, an entire conflict that was faked on wikipedia, lasting five years before being discovered. Chris also revealed a hoax of his that I hadn’t heard about. 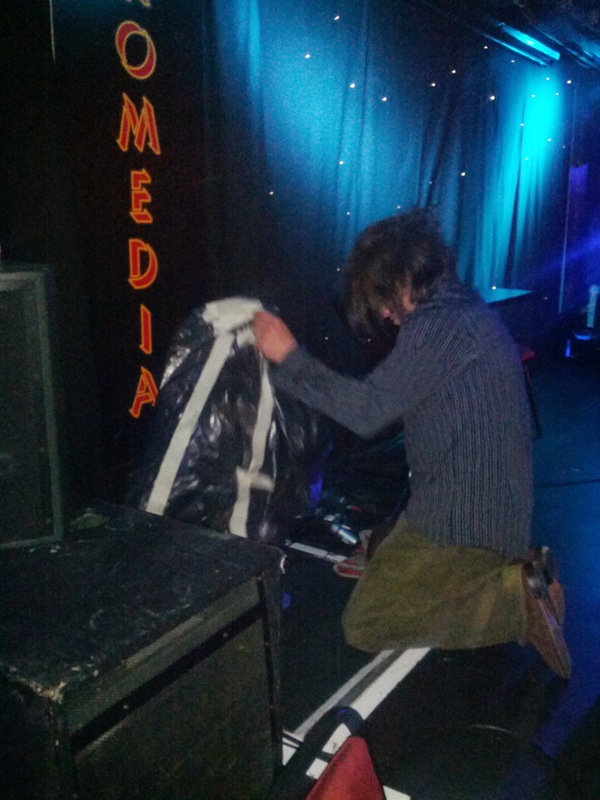 Check out the wikitravel article for Shoreham-on-Sea, archived from November 2012. Notice anything strange? This lay unaltered for about 18 months. At one point, the Lovely Brothers excitedly showed Chris this strange thing they’d found. At the end of his talk, Chris urged the audience, “Leave your stories lying around in unorthodox, unethical locations,” pointing out that his quick hoaxes had gained larger audiences than his self-published collections. Maybe people should embrace this new genre, flinging stories into the world to see which take root. Posted on September 28, 2014 Author orbificCategories MechaPoet, Things That Happened, Writing3 Comments on Where to publish your stories? 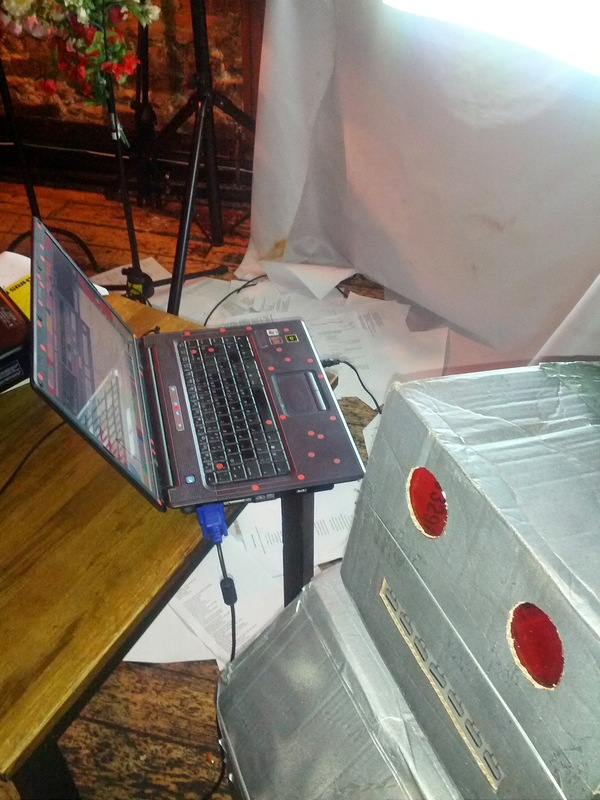 The MechaPoet is my attempt to rescue humanity from the drudgery of writing verse. I’m not quite sure when the idea emerged, but as Chris explains, we were originally considering a computer program to generate real-life slash fiction. 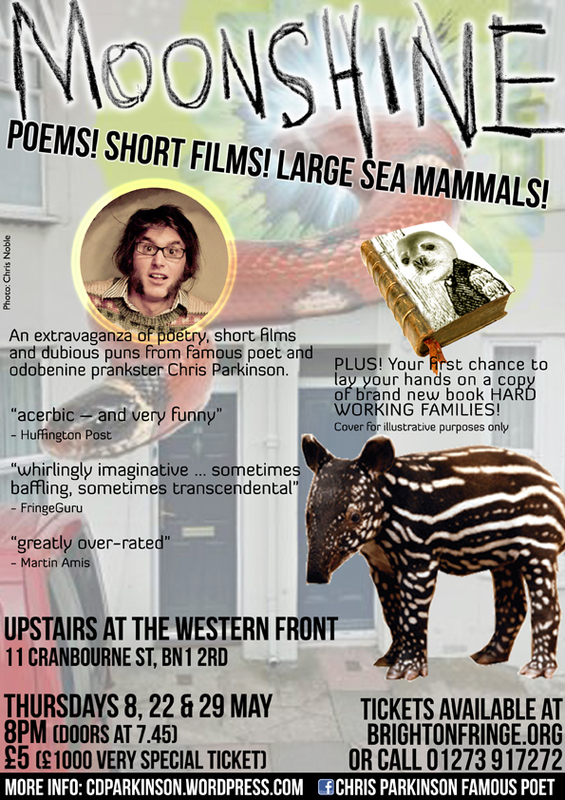 Which might still happen, but these things take time (we originally hoped to debut the MechaPoet in February’s Brighton Science Festival Slam, which will give you an idea of our pace). 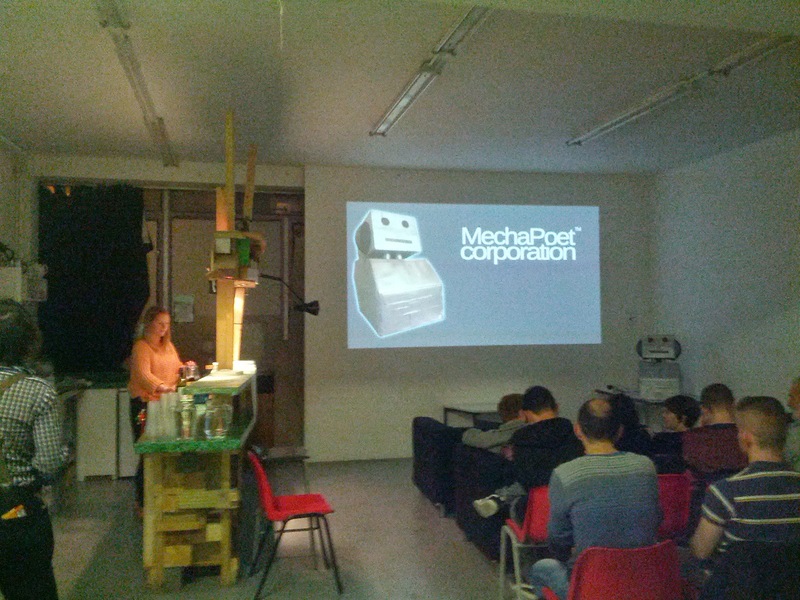 The MechaPoet finally made its public debut at this month’s Brighton Java meeting. It’s a mix of Chris’s hardware skills and my programming. MechaPoet takes a big pile of texts (tweets from me and Chris along with the texts of Jurassic Park and American Psycho), learns the patterns in them, improvises a rhyming poem, then recites it. The results are surprisingly good – occasionally a line will make me laugh or even prove moving. A lot depends on the soiurces used. Tweets tend to produce something quite emo, whereas novels produce something more consistent. The techniques I’m using are not particularly obscure. Computer-generated poetry has a long history, dating back to the 1950s. Most of the techniques were outlined by the time Oulipo‘s ALAMO project wound down. The MechaPoet text itself is generated by Markov chains, not a particularly sophisticated technique (a really good, gentle introduction is here). Chris has done a good job of explaining the non-technical aspects of the project, so I should probably talk a little about the programming. The MechaPoet was written in Java, which is a lousy language for hacking together prototypes, particularly for text manipulation – but when I wanted to produce the robot, I didn’t want to fiddle about learning Groovy, or sharpening my blunted Python skills. The first version of the MechaPoet used the FreeTTS voices, which were good enough to tell that you were hearing poetry, but many of the words were garbled. There is a recording of the original voice on Youtube. I tried a number of different voice packages but couldn’t get any of them running on Ubuntu. 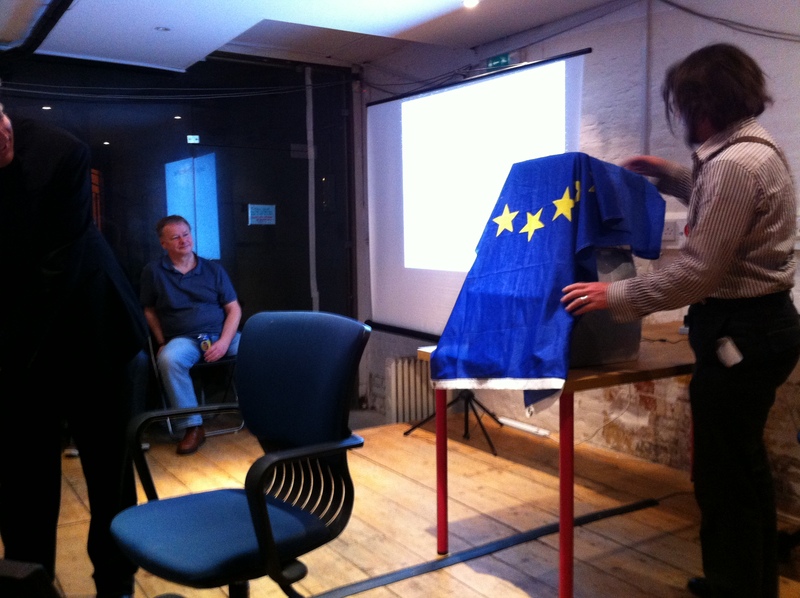 The good thing about sharing a project at an event like Brighton Java was getting feedback. Luke from Brandwatch showed me the latest Google TTS voices, which were incredible. I spent Good Friday hacking together a new version of the MechaPoet to run on my phone. The solution involved a microservice using Spring Boot with an Android client. It’s interesting to see the places a good project will take you, and making my first Android app was fun – although it would have been easier if I’d read more about programming Android in advance. The only problem with the current version is that the new Google voice is a little too good. 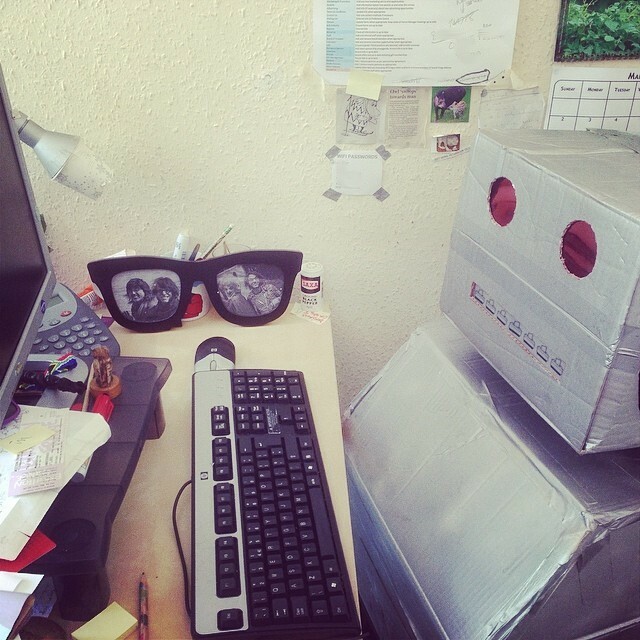 With a scratchy robot voice, people are more willing to forgive little errors in pronunciation and emphasis. The Google voice is so clear that there is something of an uncanny valley problem – errors are jarring rather than charming. The next piece of work I need to do is to reduce the quality of the voice a little to make it flow better. 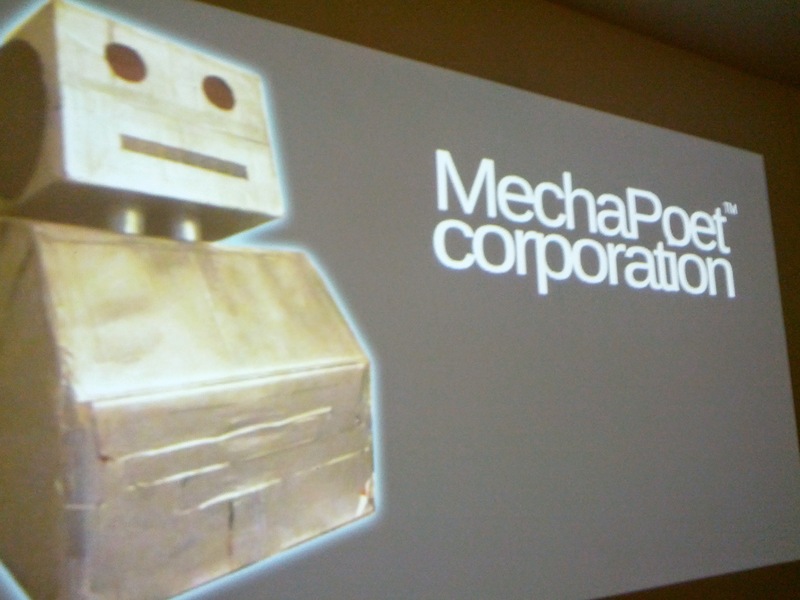 There are some interesting questions about whether what the MechaPoet does is poetry or not. After all, many human poets such as Tristan Tzara and Kenneth Goldsmith have worked with algorithms or arbitrary techniques. William Burroughs argued that the cut-up technique was still authorship, since the user chose the source texts, where to cut etc. I’d argue that the MechaPoet’s work is actually written by Chris and I rather than the algorithm. Poetry is a wide and complicated artform: a good example of this is Bot or not, a website that asks you to choose whether a piece of poetry is human- or computer-generated. The crossover between those two categories is significant.